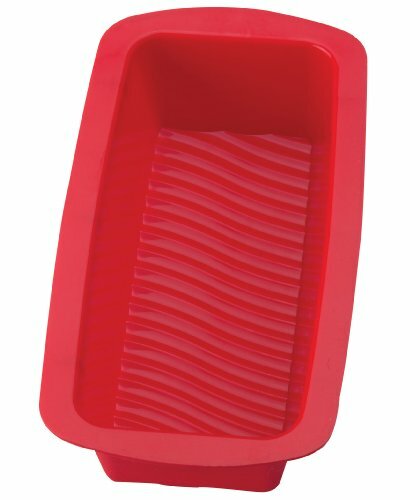 Mrs. Anderson’s Silicone Loaf Pan is perfect for baking quick bread recipes, loaf cake and bread recipes, and meatloaf. Made from 100-percent European-grade silicone, Mrs. Anderson’s specialty bakeware offers the same quick food release and easy cleanup as FDA-approved silicone but is even more flexible and durable to maintain its original shape and non-stick qualities through more uses. Designed with ample support to stand on its own, yet flexible enough to unmold foods with a gentle twist. Subjected to higher standards of testing for a superior food grade silicone, European-grade silicone baking pans maintain their elasticity and flexibility longer, and are stronger and more durable to withstand everyday stress and strain, like twisting to unmold and release foods, yet bounce back to their original shape. Their non-stick property is maintained through more uses than other cake molds in an even wider range of temperatures, from -40-degrees to 500-degrees Fahrenheit, for an amazing baking experience every time. Mrs. Anderson’s Silicone Loaf Pan is easy to use. Simply place it on a cookie sheet, pour in cake batter, and bake according to recipe. Great for baking pound cake, coffee cake, banana bread and zucchini bread, fruitcake, meatloaf recipes, and more. Safe to use from freezer to oven, microwave and dishwasher. BPA free. Includes instructions. Flexible and naturally non-stick to release foods with ease. Dishwasher safe for easy cleanup. Do not use knives, scrapers, brushes or cutters. Never cut in the baking pan. Brought to you by HIC Harold Import Co.